Jazz up your walls with these awesome flags! 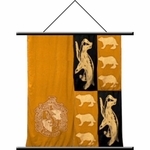 Representing the various houses of the Hogwarts School of Witchcraft & Wizardry, these banners are perfect for any fan. 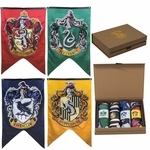 Slytherin, Ravenclaw, Hufflepuff, and beloved Gryffindor are all represented, along with other Harry Potter themed wall hangings!